You can find a lot of information about society on the internet. Learn how to get photos from a hard disk into an indexed catalog. You'll also learn how to navigate the Folder Location view. Use with either Photoshop Elements version 7 or 8. A performance by the Alash Ensemble at International House. 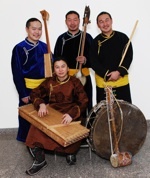 Tuvan throat-singing and traditional Tuvan instruments and music. Sponsored by the Center for East European and Russian/Eurasian Studies. Professor Peter Robertson, Business School, University of Western Australia presents "China's Economic Transformation and Implications for World Political Economy". 45th Otago Foreign Policy School. 25 June 2010. When you say that someone is ‘poor’, what do you mean? Do people whom others call ‘poor’ always see themselves in that way? Literature 331 offers students an opportunity to enhance their understanding of contemporary global interactions by exploring a diverse array of culturally expressive artifacts---novels, short stories, and poems--grouped geographically by region. Course readings represent the following regions: Europe, Asia, and Africa and the Middle East. A second course, Literature 330, covers the literature of North America, Latin America and the Caribbean, and Australia and Oceania. Although the audio file included in this unit was designed to compliment the D218 Social Policy: Welfare, Power and Diversity Open University course its contents are still relevant to anyone wishing to improve their understanding of note taking. The audio file, however, uses specific examples associated with the Social Sciences. The audio file was recorded in 1998. John Clarke discusses the value and best ways of note taking with OU colleagues Esther Saraga and Gerry Mooney. 1 min. Vídeo. National Film Board of Canada.